Three men have been sentenced to a total of 19 years imprisonment for their parts in antiques thefts across the South of England. Steven Abberley, 42, a tattooist, of Findon Close, Hove and Mason Abberley, 19, also a tattooist of May Road, Brighton, pleaded guilty to burgling 12 and eight properties respectively when they appeared at Hove Crown Court on October 12. Paul Ansbro, 55, an antiques dealer, of Church Road, Hove, pleaded guilty to four burglaries and handling stolen goods from two others. 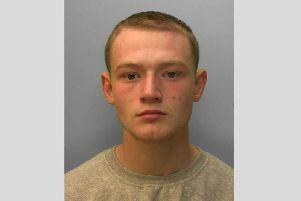 They were sentenced at Hove Crown Court on Friday, December 11. More than £120,000 worth of antiques were stolen from properties in Sussex, including Cowfold, Friston, West Chiltington, Washington, Goring-by-Sea, Glynde and North Chailey, and in Emsworth in Hampshire, Saffron Walden in Essex, Marlborough in Wiltshire and Cambridge in Cambridgeshire. Steven Abberley received nine years for 12 counts of burglary; Mason Abberley was given two and a half years and Paul Ansbro was sent to prison for seven and a half years for four counts of burglary and two counts of handling stolen goods. Detective Constable Jonathan Stadius said: “This was an organised group of burglars operating in a wide area across the South of England. Ansbro was a travelling antiques dealer who identified vulnerable victims across the south east and tipped off the Abberleys to target them. “The offences spanned less than a two month period starting on December 31, 2013 until Stephen and Mason Abberley were arrested in February 4, 2014. “They specifically targeted properties for the purpose of stealing antiques including paintings, trinket boxes and antique furniture including grandfather clocks while the residents were asleep inside. “Some of the property stolen has recovered by police and has been returned to its owners, but many sentimental items remain outstanding. “The Abberleys and Ansbro targeted those most vulnerable in our society stealing valuable and highly sentimental items, in order to feed their gambling and drug addictions. In court the judge praised the officers, especially DC Jonathan Stadius, who worked hard to bring these three men to justice.